We can recover the files from the old Amstrad PCs with 10mb 20mb and 30mb hard disk drive. This includes models PC3086 PC1512HD10 PC1512HD20 PC1512HD30 PC1640HD20 PC1640HD30. They were also sold in the US as PC6400, by Sinclair as the PC500 and badged by Schneider. The Hard Drive came with their own dedicated disk controller in an 8 bit ISA slot. The drives had 2 flat ribbon cables as well as a molex 4 pin power connector. They were based on the old Seagate ST506 interface. The PC1512 was also sold as the Sinclair PC500. In the US the PC1640 was marketed as the PC6400. The controller used an interface called the ST­506 after Seagate ST­506 hard drive. The PC3086 used a rare Western Digital (WD) XT IDE hdd Western Digital WD93034-8 AD date: 12-22-1990 S/NWD241182 Cyl:782 Hds:3 Hd1 Cyl:631 Byte 11200.. At first glance the hdd might appear to be compatible with modern parallel ATA IDE but is in fact 8 bit and will not interface correctly. We can read the data off the hard disk and copy the files to say a USB or email them back to you. Transfer files from Amstrad PC XT HD10 HD20 and HD30 problems that we recover data from are listed below. 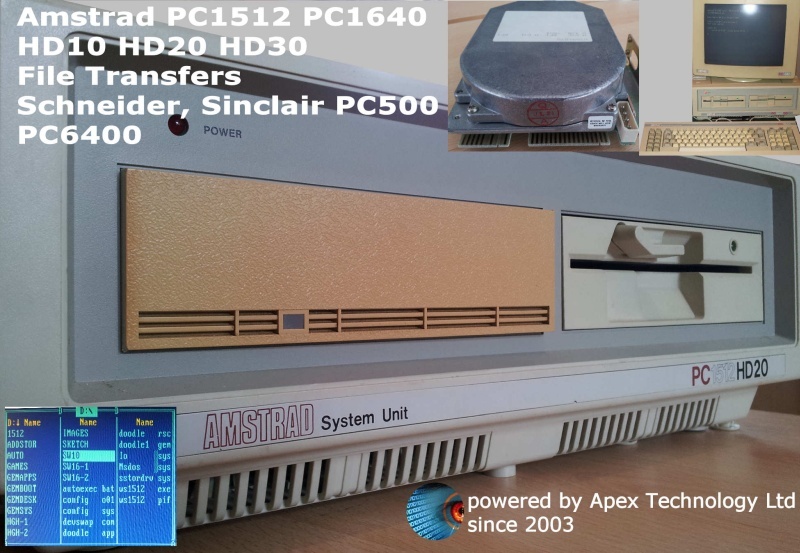 We transfer files from Hard Drives found in Amstrad PC PC3086 PC1512 and PC1640 HD10 HD20 HD30 8bit SCSI disks,the PC6400, Schneider, and Sinclair PC500.